Ford has shipped all models of its 2015 Transit full-size van, including the cargo, passenger, cutaway, and chassis cab models, representatives for the automaker told Automotive Fleet. 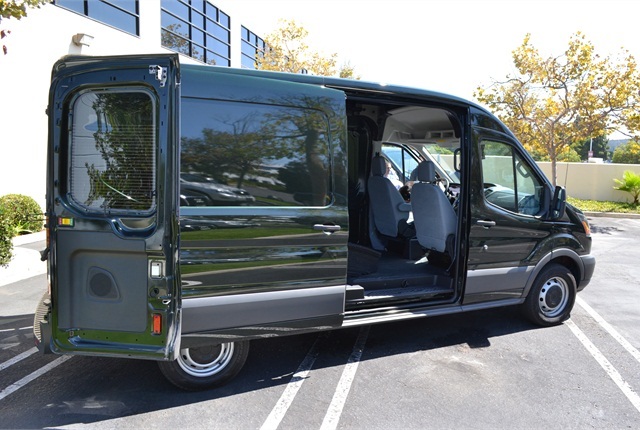 The van is available in 58 configurations. Ford shipped the cargo and passenger versions of the Transit in three body lengths, two wheelbases, and three roof heights in late August, said Chris Brewer, the vehicle's chief engineer, during a visit with Automotive Fleet editors on Sept. 11. The Transit is replacing Ford's E-Series van. Current order-to-delivery times for the van that's being built at Ford's Kansas City assembly plant now stand at an average of 60 days. The vehicles can be ordered directly from Ford or via the the dealer network, including 750 commercial dealers in the Business Preferred Network (BPN), said Megan Gillam, Ford's commercial vehicles brand and fleet communications manager. The Transit is available with a choice of three engines, including the standard 3.7L Ti-VCT V-6 as well as optional 3.5L V-6 EcoBoost or 3.2L inline-5 diesel. Ford expects diesel engines to make up about 20 percent of Transit sales, Brewer said. Ford is also offering the Transit in three chassis cab and cutaway models, including the 250, 350, and 350 HD. The cutaway model offers direct access from the cab for ambulance and hotel shuttle upfits, while the chassis cab cab accommodate a custom delivery body, utility box or flatbed.